I use gesso to prep the surface of my substrate when I embark on a mixed media project. I also use it as an alternative to white acrylic paint on my artwork because it is less opaque. 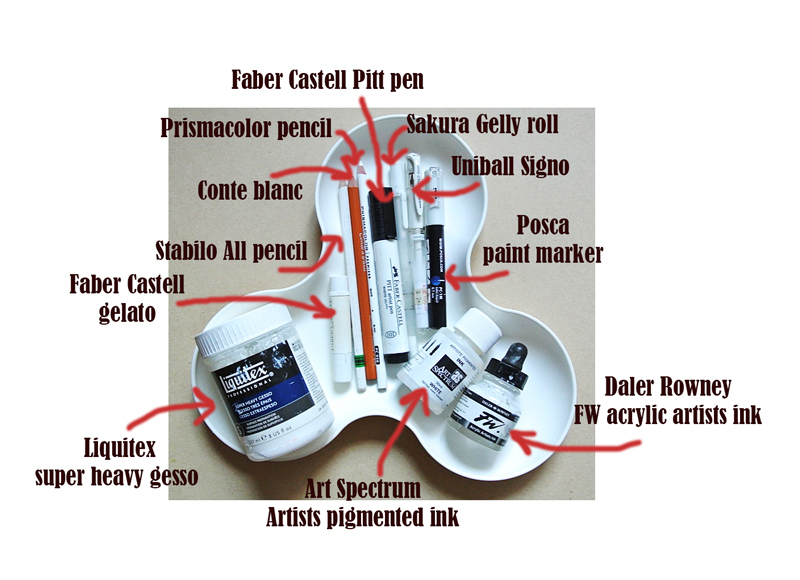 I have tried many brands of gesso and I think that Liquitex offers great artist quality gesso for a reasonable price. I love the super heavy gesso version because it can be thinned down with water for a lighter consistency and used as is for a thicker coverage. This watersoluble crayon is great for adding finishing highlights on a face. I also use this white over a (dried) dark paint colour to lighten it. This incredible pencil writes on almost all surfaces including glass, plastic,paper, porcelain and metal. When I've gone too dark, I use this as the last step to draw out the highlights. It is watersoluble and makes a great drawing tool on dark surfaces. This is an interesting pencil made from a blend of natural pigments, kaolin clay and graphite. It is smudge-proof and I use it to colour in the white in my eye drawings. This wax-based pencil is soft and extremely blendable. I use it to lighten dark shades and to highlight aspects of my artwork. This India ink brush pen goes on very bright and vibrant and I love using it to draw out larger highlights. I love using this gel ink pen for journaling on a dark surface or photos. The fine tip also makes it great for drawing in the finer details in my paintings/drawings. It is important to clean your pen nib periodically to ensure smooth flow of ink. I use this like the Sakura gelly roll - for journaling and highlighting. This one writes better on glossy surfaces (like photos) but the broad nib is not suitable for small areas. This is acrylic paint in a marker form so I use it for anything you might possibly use white paint for. I've used it to colour in chipboard, journaling, cover up "mistakes". These are very pigmented white ink with slight variations in consistency (AS is much more fluid) and I use them to create dynamic splatters on my artwork. 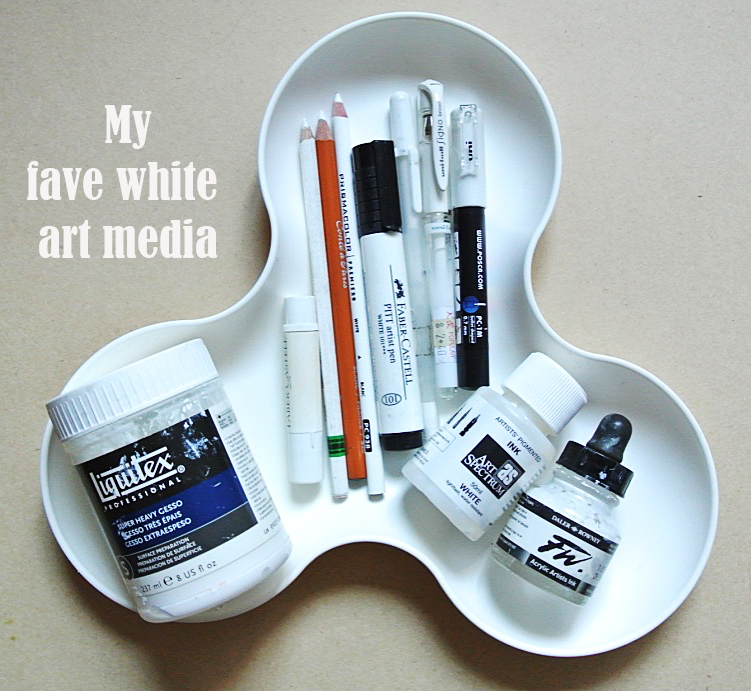 There you have it...my fave white art media. Do you utilize any on your projects? I've been using my Prismacolor white color pencil for journaling on dark paper. I haven't had consistent luck with white pens. I also use a fair amount of white gesso for covering boxes, cardboard tubes, etc. Well, It looks like a great masterpiece and I also like these type of artworks from the Artist, We cheap assignment writing online always appreciate the things which will be done for the betterment of next generation and we should do something unique as well like this. We have professional assignment writers to give you science assignment help UK. Rely on us as we assign only the best of the best writers for this purpose.Just in case you are wondering how our writers will ensure online assignment writing help, we would like to mention that the experts associated with our firm in flawless manner. You should study in a way that you do not compromise with your health. Good health is a prerequisite for you to be able to study efficiently and to maintain motivation to do so. Sometimes, assignments also act as a hindrance in following your timetable. In such situations, you can take Java Assignment Help. Assignment help shop is a well-established and prominent name in providing high-quality assignment help online to students since almost a decade. You can trust our academic ghostwriters completely to get best quality write-ups including case studies, research proposals, dissertations and theses, and more. It is the best assignment help provider.Students should always keep themselves ready to meet the university requirements in order to achieve good grades, moreover, they prefer attending lengthy classes instead of writing assignments. Students who are not comfortable with writing assignments can avail university assignment help by buy assignment help at Assignment Help Shop. A deductive essay is a form of an academic essay, in which the writer should present logical reasoning in a form of a deductive argument. The professors assign this task to check the student`s ability to think logically and be able to present the sound and reasonable arguments to support some position. It is also important to follow the deductive writing style . Assignment Help Firm is a well-known firm in United Kingdom. We have subject specific experts who possess handsome experience in writing and improving student skills. There is a various writing service available. Assignment Help UK is one of them.